Recess and playtime these days is tame compared to what kids got up to over a century ago. You can bet that boys playing these brutish games—which came from the pages of Games and Sports for Young Boys (1859) and Thomas Sheppard Meek's Young People's Library of Entertainment and Amusement (1903)—probably suffered skinned knees and worse. You won't want to try any of these at home. The first key element in this game was a pen—either one made with twine and stakes or the kind used for livestock. The second was The Jingler. This boy with a bell tied around his neck would have his hands bound behind him, and his object was to avoid capture by other, blindfolded boys careening around the pen. A clever and nimble Jingler could manipulate and mislead the other boys into smashing into each other and the pen walls (or trip wires, if they went the DIY pen route) and might even incite a brawl between two boys who each mistakenly thought they had caught the Jingler. The winner is the boy who takes the Jingler down. (There's no tag here—one boy literally takes the other down.) The Jingler himself wins if he eludes his blind hunters for the requisite amount of time. Billed by Meek as one of several "healthful outdoor games to develop the body," Sling the Monkey involved turning a boy into a human piñata—albeit one that could hit back. The boy was tied to a sturdy tree branch with a rope around his waist, his feet just touching the ground. Once he was in place, his friends, armed with knotted handkerchiefs, would begin “basting” (joyously beating) the Sling Monkey. "With players who don't mind a little buffeting this game becomes exceeding lively," Meek wrote. "[A]n active monkey is very difficult to approach with safety and, of course, gives much more life to the game." If the Sling Monkey, who was also armed with a knotted cloth, managed to smack any one of them in return, he was let down from the tree. With the motivating sting of his wounded flesh and pride, he would then galvanize the tiny mob to return to beating the child who had taken his place. Kids who played this game first had to obtain, or make, a bow and arrow or crossbow. (This wasn't difficult: Nearly all books written on children’s crafts before 1950 gave detailed instructions on how to make homemade projectile weapons.) Next, the kids erected a 90-foot-tall pole crossed with Christmas-tree style beams at the very top. Into these beams were “deftly stuck” feathers. The goal was to knock the feathers off by standing under them and shooting arrows at them—not a simple task. The arrows, according to Meek, should not "[terminate] in a point in the ordinary manner" but instead "have at the end a piece of horn shaped like a bullet"; he recommended that the person in the position of arrow-gatherer be given “an immense wicker hat” that would protect him from the rain of arrows coming down on his person. According to Meek, this game—which involved boys trying to smash each other in the head—"is causing a great deal of amusement at social gatherings in Europe." 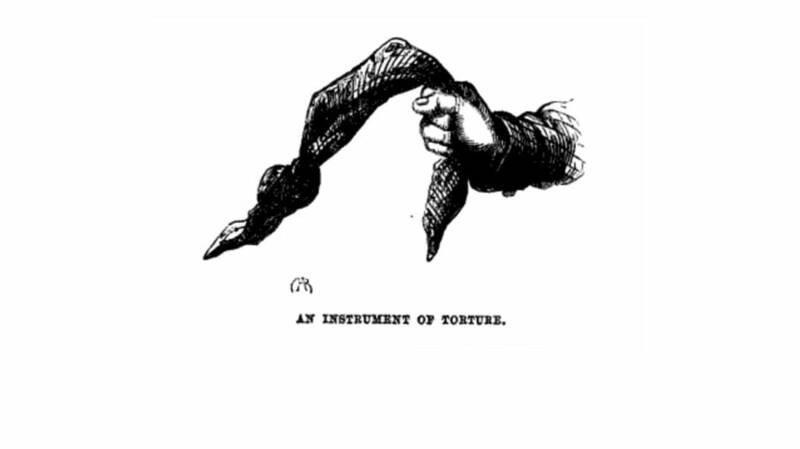 Here's how it worked: Two boys were blindfolded and "in the right hand of each [was] placed a stout roll of paper in the form of a club or cudgel." Next, they laid on the ground and clasped left hands. One player would call, “Are you there?” When the other answered, “Yes,” the first boy struck out in the direction of the sound with his club, aiming "to hit the spot where, from the sound of the voice, he supposes the other's head to be." But since the one to be clubbed is allowed to move his head, “nine times out of ten” his opponent only succeeded in hitting his shoulders, neck, arms, and chest. In centuries past, to “draw an oven” was to pull its contents out, whether it be bread or pottery. In this game, the bread was very stubborn and fought back. Basically, it was a game of tug-of-war where the rope was not a rope but a series of human boys. A line of boys sat on the ground, each boy clasping his arms around the waist of the boy in front of him. When it was time to play, two other boys grabbed the arms of the first boy and, according to Games and Sport for Young Boys, "[pulled] away vigorously." The boys on the ground, meanwhile, countered by pulling backward on the front boy’s waist. Once the front boy was disengaged from his line, the two yankers proceeded to the next little loaf "and so continuing 'drawing the oven' until they have drawn all the players from the ground." There aren't really winners and losers in this game; apparently it was enough fun to keep pulling boys like so much taffy until enough bruises were distributed. This game was composed to two evenly matched teams of either six or eight players. The team that lost the toss lined up, with the first boy facing a wall with his hands on it; each of his teammates then bent and rested his head on the rump in front of him, clinging to what the 1859 text described as the previous boy’s “skirts.” "When thus arranged," the text noted, "they are called 'nags.'" Once the nags were in place, the teams began a harsh version of the game of leap frog. The best jumper of the opposing team ran at the nags, yelling "Warning!" and leaping as far as possible on the back of a boy—hopefully, the one closets to the boy with this hands on the wall. His whole team followed until they were all astride the backs of the nags. The goal was to break the boy under you, fairly literally: If any boy could keep from crumpling under the weight of the jumper sitting on him for the time it took to chant, “Jump little nag tail one two three” three times followed by “Off off off!” the nag team lost and had to start again. If the jumpers fell off, however, or if there were not enough nag backs for them to sit on, then they became the nags. The cruel practice of bear baiting got a strange twist in this game, which replaced the bear with a child. According to Games and Sport for Young Boys, "[The bear] kneels on the ground in a circle ... Each Bear may select his own master, whose office it is to hold him by a rope, and use his utmost efforts to touch one of the other players, as they try to thrash the Bear." Instead of unleashing dogs on the “bear,” he is simply beaten with knotted handkerchiefs that are twisted "very tightly." The Master must tag one of the bear beaters without letting go of the Bear’s rope or stepping out of the circle. If he succeeds, the tagged boy becomes the bear, and the young men continue their healthy outlet for pent up frustration.